Because biomedical research has become a very fluid environment, the MD-PhD Training Program prepares its scholars to adapt and utilize their acquired skills and knowledge towards the creation and implementation of strong, focused research. For the advancement of knowledge to take place, the sharing of ideas and data critical to make translatable discoveries into treatments must occur. 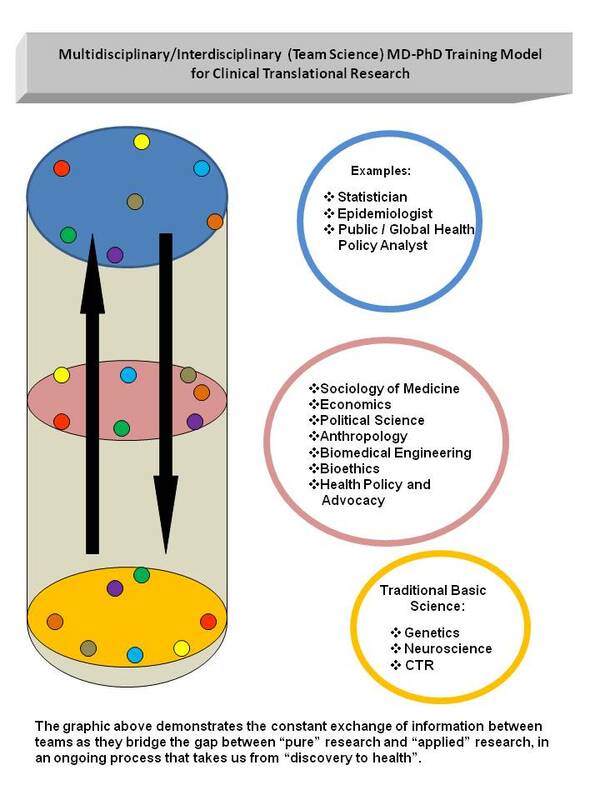 A component of this paradigm is based on the “team science” concept that seeks to create collaborations among many disparate research areas. In acknowledging that there will be a need for diverse skills in translational science, scholars from many disciplines outside of the basic sciences are readily welcome. To this end, it has become routine for us to explore hybrid educational models. For example why not bioengineering, synthetic biology, nanotechnology or epidemiology. The MD-PhD Training Program is designed to create a synergistic relationship between the basic sciences and selected complementary areas of study. 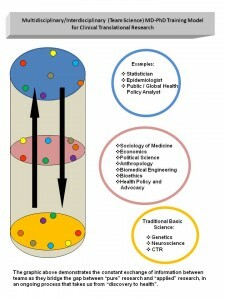 While opportunities for finding academic programs in the traditional biomedical sciences programs are abundant, our “alternate pathway” (“Beyond the Wet Lab”) approach combined with our clinical translational “flavor” offers outstanding opportunities for research and discovery within and across unlimited contemporary disciplines.